Shipping rates cover normal delivery within the continental U.S. Shipping to Alaska, Hawaii and other continents are available at additional cost. Growing and Building is a narrative story of events that transcended the author’s life, his family’s life and the life of Officers’ Christian Fellowship, the lives of great characters of the Bible, and the lives of other great leaders. To purchase Growing and Building in Paperback, please contact us directly at 850-279-3451 or by email. There is a limited quantity of paperbacks available. 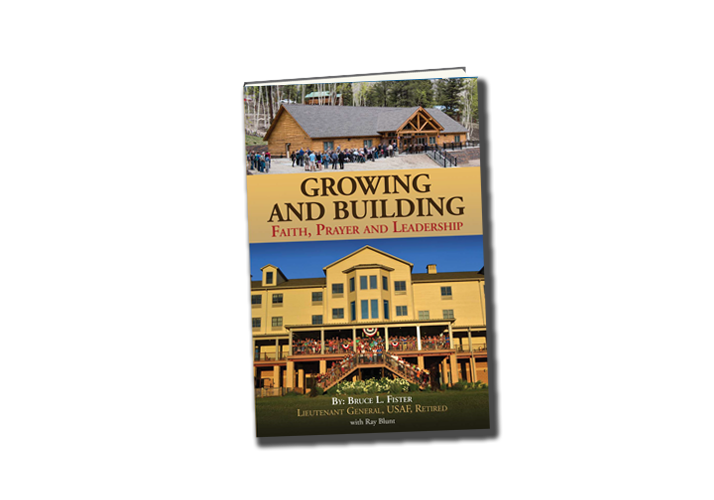 Growing and Building demonstrates lessons in faith, prayer and leadership centered around biblical and personal stories derived from the authors time leading Officers’ Christian Fellowship’s Growing and Building Campaign. This was a 10-year project to build new conference center facilities that were necessary to grow a 73-year old, worldwide Christian military fellowship so it could continue to reach the U.S. military society in the 21st century. The story begins with the realization that OCF had to replace old worn out facilities at their two conference centers, Spring Canyon in Colorado, and White Sulphur Springs in Pennsylvania. These conference centers have been serving soldiers, sailors, airmen, marines, and coastguardsmen and their families for many years, but now are more important than ever because those wonderful people have been stretched to the breaking point by multiple years of combat in a global war on terrorism.